For our NV60-M2, we analyzed the drum sound that stormed the rock world in the 1960's. 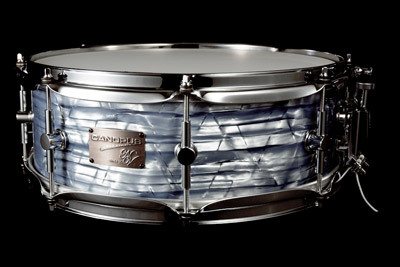 The shell construction is made of 3 ply mahogany and poplar with a maple reinforcement. Thin 1.6mm pressed hoops that are customized for the NV60-M2 shells further refine the vintage sound. The attack sounds from the surface of the head father than the point to create an immediate response with sticks and beaters. Crisp and clear sounds recreate the nostalgic sensation of a vintage rock kit and cleanly articulate every audible stroke. *We recommend as the standard specification for the NV60-M2 without bolt-tight washers since we put more emphasis on the reproduction of the vintage sound of 1960s.